The Data Connect 5208V-SMS25 is an 8-Port VDSL2 Management CO Switch (Central Office) with 2-Port Gigabit TP / SFP combo interfaces. The VDSL2 CO Switch is perfectly designed for the networking application of Community, Network service provider, SI (System Integration), IP Surveillance provider and etc. It is based on two core networking technology, Ethernet and VDSL2 (Very-high-data-rate Digital Subscriber Line 2). By co-working with the Data Connect developed VDSL2 CPE (Customer Premises Equipment) – the 520XV Series, it offers the absolutely fastest data transmission speeds over existing copper telephone lines which provides the ideal solution in the last mile. 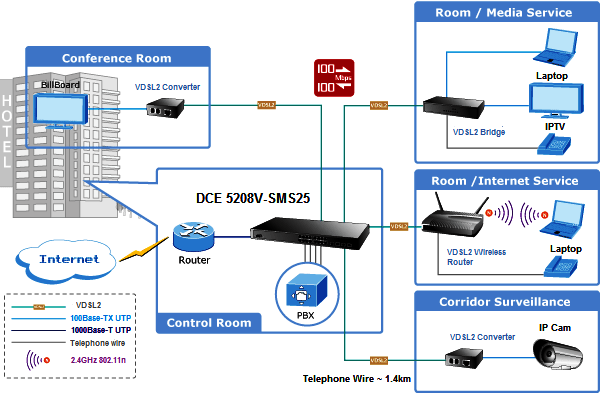 Each VDSL2 interface of the DCE 5208V-SMS25 provides two copper phone ports, one for VDSL2 connection and the other one for POTS (Plain Old Telephone Service) connection. To share the existing phone line with POTS, the DCE 5208V-SMS25 has built-in POTS splitter that helps the voice over telephone and network data to transmit at the same wire without being interrupted. The Data Connect 5208V-SMS25 gives the excellent bandwidth to satisfy the triple play devices for home entertainment and communication. The VDSL Switch contains robust QoS features such as Port-Based, 802.1p priority and also IP TOS/DSCP. It guarantees the best performance at VoIP and Video stream transmission and empowers the enterprises to take full advantages of the limited network resources. Through the management interface, the administrator can control the data transmit speed of each VDSL2 interface. Telecom and ISP can immediately and remotely upgrade/downgrade bandwidth service by different demands. Afford the current network to grow and expand, the Data Connect 5208V-SMS25 provides console and telnet command line interface, advanced WEB and SNMP management interface to fill this kind of demand. With its built-in Web-based management interface, the VDSL2 Switch offers an easy-to-use, platform independent management and configuration facility. The VDSL2 Switch supports standard Simple Network Management Protocol (SNMP) and can be monitored via any standard based management software. For text based management, the VDSL2 Switch can also be accessed via Telnet and the console port. Moreover, the VDSL2 Switch offers secure remote management by supporting Secure Socket Layer (SSL) connection which encrypts the packet content at each session. The features above provide an efficient way to manage the devices from the internet environment with no need to add extra secure system either by means of hardware or software. For efficient management, via WEB interface the DCE 5208V-SMS25 can be programmed for basic switch management functions such as port speed configuration, Port link aggregation, IEEE 802.1Q VLAN and Q-in-Q VLAN, Port Mirroring, Rapid Spanning Tree and ACL security. Additional, the firmware includes advanced features such as IGMP snooping, QoS (Quality of Service), broadcast storm and bandwidth control to enhance bandwidth utilization. The VDSL Switch offers comprehensive Layer 2, Layer 3 and Layer 4 Access Control List (ACL) to filter out unwanted traffic. It protection mechanism comprises of radius and Port-based 802.1x user and device authentication. Moreover, the VDSL2 Switch provides MAC filter, Static MAC, IP/MAC binding and Port Security for enforcing security policies to edge. The administrators can now construct highly and secured corporate networks with considerably less time and effort than before. IPTV, VOD and digital message broadcasting service are the worldwide hot trends, and more and more service provider have gradually upgraded the client side devices from analog system to digital system gradually. The Data 5208V-SMS25 VDSL2 CO Switch and 520XV VDSL2 CPEs are the best solution to quickly provide cost-effective and high speed network services by utilizing the existed telephone wire infrastructure. IP network installation is straightforward and requires no new wiring. With enough bandwidth, the up to 100/100Mbps symmetric capability of 5208V-SMS25 enables many Multi-Media services on local Internet to come true, such as VOD (Video on Demand), Voice over IP, Video phone, IPTV, distance education, and so on. The DCE 5208V-SMS25 provides excellent bandwidth to satisfy the triple play devices for entertainment and communication. Meanwhile, this kind of infrastructure will minimize the burden on the Internet. The Data Connect 5208V-SMS25 provide up to 100/100Mbps symmetric data rate within 300m and in long range connections, it provide ultra-high performance to pervasive telephone line network. With the two build-in mini-GBIC 1000Base-SX/LX SFP (Small Form – Factor Pluggable) interfaces, the deployed distance of DCE 5208V-SMS25 can be extended from 550 meters (Multi-mode fiber) up to above 10/50/70/120 kilometers (Single-mode fiber). The various distances of SFP and Bidi (WDM) transceivers are optional for customers. 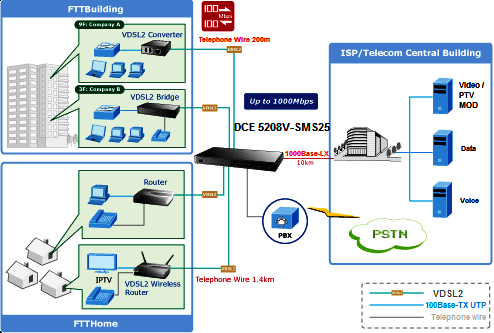 The long distance support feature makes the DCE 5208V-SMS25 be a great and ideal solution for FTTx (Fiber to the Building, Fiber to the Campus of Fiber to the Home) application. It supports high bandwidth VDSL2 over existing telephone wires in the “last mile” from the ISP / Telecom / Service provider’s fiber node the building and customers’ home. Voice QoS by application source / destination protocol no. – VoIP QoS by application protocol no.